My name is Sampson Adotey Jr. from Ghana. I’m an Advocacy and Communication Associate in a development consulting firm which uses participatory approaches in its line of work. My background is in Development Communication and the past 4 year I have worked as a journalist. I am very passionate about volunteering and issues about poverty, environment, and education. Want to know why I fell in love with world climate and decided to run an event as a part of the World Climate Week? Read below! Why did you decide to organize a World Climate event? 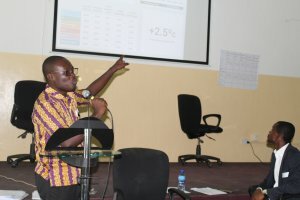 Owing to the formalized nature of international discussions on climate change and considering the importance of involving the present minority (youth in my country, Ghana) who will be the future majority, I saw the need to organize a World Climate event. 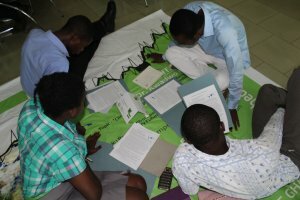 Through this exercise I knew that we could identify the values and initiatives that youth can take towards climate action. In which ways did the Climate Interactive team support you? Climate Interactive team has been of great support to me. I am very much grateful to Juliette Bohland for taking time to take me through an online training and Grace Mwaura for keeping up with me and helping out as well. Through the videos, webinars and blogposts, I have learnt so much about how C-ROADS can be used to influence behaviour change and for me that is a plus. I am also very much appreciative of the small grant I received towards preparing materials for the event. How did you feel about organizing such event? The feeling about organizing such an event was great. I was extremely excited about the opportunity to use this platform to influence young university students from over four institutions. To touch their hearts and cause them to think on how to take action on climate change gave me much satisfaction. I was also surprised when one of the students spoke to me about their decision to hold a forum on climate change and also extended an invitation to me to speak about how journalists could report on climate change issues and environmental reporting. Was there anything or anyone that helped you organizing this event or conversely that was a barrier to overcome? Yes! It’s important that I acknowledge the support of the organization I work with. They were extremely helpful in assisting me put this together. They helped me organize a training workshop for the students prior to the event and also gave out certificates to the participants of both events. On the whole, I am very grateful to the staff and management of Participatory Development Associates for the role they played to make the event successful. The event was amazing, the interaction was epic and it was as if the participants had known each other for years. They made strong cases and arguments and as a matter of fact, the China and USA team had some healthy bunters as to who was to assume responsibility more for cutting down emissions. On the whole, the participants realized that we all had a role to play to save the earth. In spite of differences in race, economic situation, or whatever difference and the time to act are now. I am proud of the students who made it to the event and most importantly, the facts that they opened themselves up to learn and fully participate. They had so much fun in learning that they kept hanging around to take selfies.